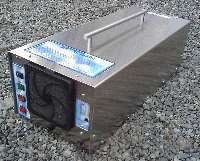 SEE Compare uv ozone generator to corona discharge ozone generators. Mobile Oxygen Ozone commercial components for Mold, Smoke, ODOR & Crime Scene Clean-up (protein decomposition). The Component System (above left) has identical output characteristics of the o3o2 8000 unit, but does not come with a built-in timer. Because these components are mass produced, their cost savings compared to the red o3o2 8000 unit (pictured above) is significant. The new UV PRO 4000 and now the NEW! Ultra-High powered UV PRO 6800 will replace component systems for many users. The cost of the component system is $3,794.00, while the o3o2 8000 is $6,683.00 which represents a significant savings. The component system comes the ozone generator, a custom built mount, the oxygen concentrator, and 50' of ozone resistant tubing. Upon request, we can offer a factory refurbished oxygen concentrator for an additional $300.00 savings, bringing the component system cost down to $3,494.00. A factory refurbished oxygen concentrator has the same warranty as new, has new molecular sieve (the oxygen producing material - which should never need replacing), and the compressor is new. These units come with "0" hours on the hour meter, and all exterior panels are replaced with brand new panels, so they also look cosmetically the same as new. The ozone generation component is not available in the refurbished condition. While the o3o2 8000 is the "Mercedes Benz", the component system is far more cost effective and still highly portable. The ozone system weighs 27lbs. including the sturdy mount, and the concentrator weighs 58lbs. The weight of the o3o2 8000 is 85lbs. The new UV PRO 4000 weighs less than 25lbs., is highly reliable, and also offers stable ozone output. The component system is used as described at this page: How to shock treat using an oxygen concentrator driven ozone generator. Component ozone/oxygen mobile systems include the concentrator, ozone generator with 10 position ozone output control, custom built mount and a 50' roll of Norprene ozone resistant tubing. The oxygen fed mobile component systems are a breakthrough in equipment cost, while still providing the industry's most dependable ozone systems, and a full 3 year warranty on the ozone systems. The new UV PRO 4000 and NEW! Ultra-High powered UV PRO 6800 are breakthroughs in mobile ozone treatment, offering the most user friendly experience. No set-up required for the UV PRO 4000 or NEW! Ultra-High powered UV PRO 6800 units. These units should not be compared to any ambient air ozone generator. multiple independent systems gives greater flexibility; allows treatment of more jobs at once. multiple independent systems also ensures you will have no down time for maintenance. multiple independent systems can treat more homes at once! multiple independent systems gives you significantly higher portability that large single systems that are permanently mounted in trailers. Ozone Generators for remediation; fire, flood, ODOR, MOLD, protein decomposition, VOC, virus, and bacterial sterilization. Medical grade HEPA, carbon, and negative air filter systems for critical particle control, medical infection control units, TB, H1N1 virus isolation rooms, hospitals, cleanrooms, construction renovation, and personal use. High performance air purifiers for allergies, asthma, VOC’s, MCS and ODORS. 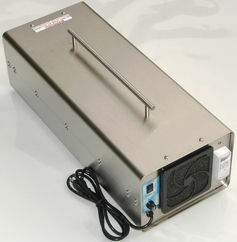 Oxygen generators for ozone systems, oxygen bars and industrial uses. See the full line of ozone generators for ODOR, smoke, MOLD, fire, Protein Decomposition ODORS, and flood remediation.